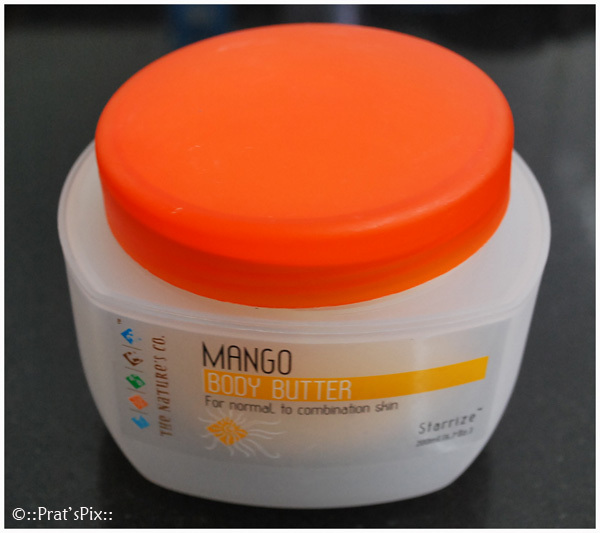 Mango Body Butter and the Sandalwood Cinnamon Oil – The Nature’s Co.
Two days ago, I received my haul from The Natures Co. I got the Mango Body Butter and the Sandalwood-Cinnamon Bath oil. Now, before I go on, I want to write a small note about The Natures Co. Here it is about them. Atmospure: Inspired by pure air this range pays tribute to the soothing and calming feeling that comes from the purity found in the atmosphere. The oxygenating process of the products in this range makes your skin breathe, thereby leaving you feeling pure and almost floating on air. Starrize: Inspired by the sun, the biggest star in our solar system. Like the sun, the products provide nourishment. But at the same time, they protect, especially against harmful radiation and its effects. Setting you up with the sparkle and energy to face the day. Foressence: The enchanted forest and all it holds is captured in this range. Brimming with colourful, exotic ingredients, strong, captivating fragrances and the goodness and variety that only a natural forest can provide. Earthborne: Of the earth and by the earth, this range is an embodiment of the earth and all the nurturing properties that are found in its soil, minerals and mud. Enriching and reviving. Aquaspark: The abundance of the oceans and rivers and all they hold find expression here. The rich aquatic & coastal ingredients in these products, like moss, red algae and seaweed hydrate and replenish while invigorating and refreshing your day. You should also go through their page on info about them. I am currently in love with everything organic and natural! And what I like about them is that they give the entire product description and you can also buy their products online. I need to find out if there is a minimum purchase above which they would ship for free. I will follow that up in my next post, but not digressing, here is my review on the products. One thing I often face in winters is cracked heels. After washing my feet with warm water and just before sleep, I used a wee bit of the body butter on my heels and massaged it. I woke up softer feet than what I usually have in the winter. My only concern is would this product have the same effect in the summer and the other seasons. Well I guess I will have to wait and watch. Priced at Rs. 1125.00 for a 200 ml cream, it is a tad expensive, but really effective. The shelf life of this product is a year and a half . I have used this just a few times and I must say that it really keeps my skin moisturised through the day. Will I buy this again? Yes, certainly. Just a point to note is that I am using this in the winter when even normal skin tends to get drier. I am not sure if it will have the same effect in the summer. This product was from their Starrize range. The only thing that is a drawback is their packaging. Considering the fact that it is a 200 ml jar, it could have been a convenient packaging that would have made it easy for me to dunk it in my purse whenever I am on the move. 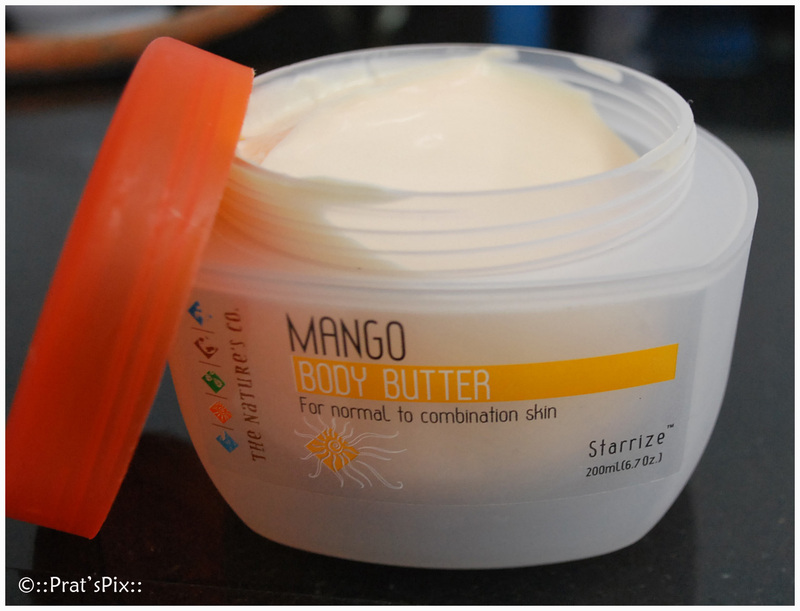 For Normal To Combination Skin Slather on our delicious, pulpy Mango Body Butter. It is rich in vitamins, minerals & anti-oxidants. Its emollient properties help regenerate skin cells, restore elasticity, and act as a protectant against the sun. For a soft, nourished skin, apply this rich creamy butter onto skin daily. Massage slowly, allowing your skin to absorb the nutrients. Reapply as needed to rough or chapped areas. Enjoy the difference! 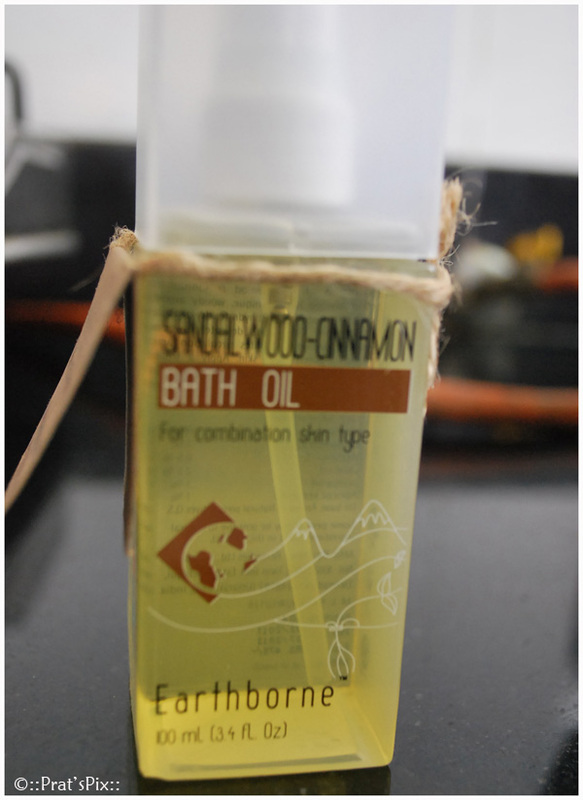 Product 2: Sandalwood-Cinnamon Bath Oil: I have never used a bath oil and I was curious about it. This product is for a combination skin type and there are two ways to use it. After a shower, use about 2 – 3 pumps of this oil and massage it on your skin to seal the moisture. Alternatively, if you are planning to soak yourself in a bath, use about 5-6 pumps of this oil in the bathtub to unwind. This oil has a very woody fragrance and the cinnamon gives a slight tingling sensation as you apply it that disappears after a few seconds. I used this after my shower and massaged my skin with the oil. It took me about a minute of not-so-vigorous massaging to get the oil soak in my skin. What I also liked about the oil was that it was not sticky. I tried using the oil without any water on my hands and I massaged it and I had soft hands for a few hours! Why I like this oil is because I am a bit attracted to the fragrance of sandalwood. I like the fragrance of sandalwood in the incense sticks and the dhoop sticks. A visit to my house will prove it because I have incense sticks and dhoops burning at least twice a day. Nourish and enrich your skin with the goodness of Sandalwood & Cinnamon. Sandalwood has a unique, woody aroma which moisturizes and hydrates dry or flaky skin while Cinnamon’s delicately sweet- spiced aroma stimulates circulation and helps tighten loose skin. Apply a small amount on damp skin after bathing as a conditioner or pour 3-4 pumps in the bath to condition and seal moisture. Priced at Rs. 475, this comes with a shelf life of a year and a half. I find this very appropriately priced. I like its packaging because it is not very bulky. I can dunk it in my tote bag and it is totally leak proof because it has a pump and a double cap protection on the bottle. Other products reviewed by The Nature’s Co. Note: These products were sent to me for a review.